The Friends of Glossop Station - who are we? The friends are a group of volunteers who give of their time in various ways to enhance the environment of Glossop Station. FoGS also hold two Community Events a year at the station. They work closely with Northern, Network Rail, High Peak and Hope Valley Community Rail Partnership, Derbyshire County Council, High Peak Borough Council, TfGM, ACoRP, Derbyshire Police and British Transport Police. Formed in 2006 following the creation of a station garden in the winter of 2005/2006 as part of a Glossop Environmental Trust project, the group was the vision of Linda Newman. 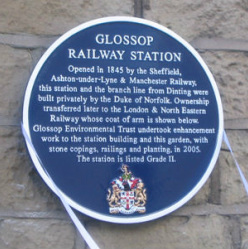 A blue commemorative plaque, unveiled by the Railway Heritage Trust, now marks the site of the garden and the early beginnings of the group. FoGS holds two Community Events a year at the station. These include Father Christmas arriving by train to mark the start of the festive season and in the summer we have hosted Teddy Bears’ Picnics and had a storytelling train. These bring children to a happy station environment. We also welcome school visits and have provided talks and with Northern's assistance, local free travel on the trains. In 2017 we held a special event to commemorate Lowestoft children being evacuated to Glossop. A special plaque has been installed on the inside station wall with a display inside the Waiting Room. In 2018 we hope to hold a special extra event on November 3rd to commemorate Armistice. Further details to follow. In April 2018 a new information board about the Lowestoft Evacuation was installed in the Waiting Room and a second copy was presented to the Lowestoft Evacuation Committee in June 2018 in Lowestoft. With the support of East Suffolk CRP and Greater Anglia this board will be placed in the booking hall at Lowestoft station in the near future. We actively promote the monthly folk trains and the local guided walks’ programme. We provide talks to local schools, church groups and organisations such as the U3A, Rotary about FoGS’ work. Please get in touch if you would like a talk! We work closely with neighbouring friends’ groups on the Glossop line at Broadbottom, Hadfield and Hattersley and Guide Bridge. We share ideas and events with our friends at Buxton, Whaley Bridge, Chapel en le Frith, Rose Hill, Heaton Chapel, Chinley, Handforth, Hindley, Romiley, Marple and Walkden too. FoGS has achieved successes in various national awards. In 2009 the group was awarded 1st prize by ACoRP in the Best Station Friends group category. In 2010 Chris Strogen was awarded 3rd prize in the ACoRP Railway Photographs competition. In the 2012 ACoRP awards the station received 1st place in the Station Development category. Neil Williams was placed third in the Outstanding Volunteer section. In the 2012 Railway Heritage Trust awards the Station received a Highly Commended in the Conservation section. These accolades have been warmly welcomed and they have marked the genuine team work that has taken place at the station to bring about significant improvements. In 2014 The Station's embankment garden was shortlisted for an ACoRP award as was Project Earth's Ceramics project at Dinting station with which FOGS was heavily involved. In September 2015 we were delighted to be awarded a Highly Commended as the Best Small Station in the UK category in the National Rail Awards.In September 2016 we received 3 ACoRP Awards - a bronze for our Embankment Garden, a third for our vintage replica lighting and a shared second with Hadfield, Hattersley and Guide Bridge for out Teddy Bears Birthday party event marking The Queen's 90th Birthday. We were delighted with these accolades! Also in November we marked our 10th anniversary at the station with a thank you event and invited guests. The year concluded in December with a very busy Father Christmas event! Details and photos of the above events can be found on our Home Page news section. 2017 proved a busy year. A highlight was the Lowestoft evacuee commemoration event which took place on June 2nd. Details and photos of this event can be found by accessing the special Lowestoft evacuation section on this website. Later in June we held our annual Teddy Bears Picnic again - a collaborative event involving station friends groups at Hadfield, Hattersley and Guide Bridge. We were also delighted to be shortlisted for two ACoRP Awards - one for the Lowestoft event and the other for our gardens and community work. We gained a GOLD Award in the It's Your Station category of which we are very proud! We enjoyed the Awards Night in the historic Roundhouse in October in Derby. The year concluded with our annual Santa event on 2nd December. We revised the format and fortunately we still received a lot of support. Our thanks to Simon Brooks our Northern line manager for his help and advice with this event. July 2018: we received a shortlisting for 2018 It's Your Station category in the ACoRP Competition. Results announced in Glasgow October 4th 2018. We were delighted to win LEAD GOLD in the 2018 It's your Station category an honour of which we are very proud! Neil Williams, FOGS' Chair, was also placed first in the Outstanding Volunteer category. Both awards were presented by Jools Townsend Chief Executive of ACoRP and Alex Hynes Managing Director of ScotRail. We would like to thank ACoRP for these significant awards and for the many kind messages of congratulation received in recent weeks from fellow friends near and far! The group meets formally four times a year at the station to plan and review its progress. Work parties also meet weekly usually early on a Sunday morning for maintenance and improvement work. If you would like to help in any way then please get in touch. There is no charge to belong to FoGS - all we ask is your commitment to our visions. FoGS continues to maintain its current areas of infrastructure work and local community involvement. In particular it seeks, with partners, to develop the restoration of other historic parts of the station. A recent success in 2014 was the replacement of historic perimeter railings along Howard Street by Network Rail. Liaising and helping our newly established friends’ groups on the Glossop line – we are proud that we now have 4 adjoining friends’ groups - is a priority too. Arriva was selected as the preferred operator by the Government and began its franchise from April 1st 2016. We have now worked for over three years with Arriva Rail North and its management team headed by Liam Sumpter Regional Director Central, ( Liam was our guest at Christmas 2016 event at Glossop Station) Vicky Cropper, Community and Sustainability Manager and Simon Brooks, our Line Manager based at Guide Bridge. We are enjoying developing our professional relationships with this team. We said a very fond farewell to Theo McLauchlan, our former line manager, in March 2017. Theo is currently on secondment from his role as Line manager and is managing Northern central's building portfolio. September 2018: we said another fond farewell. This time to Vicky Cropper who has worked indefatigably on behalf of all local friends groups! Vicky has shown a keen interest in our work and has helped us to organise various events. Her personal and practical approach has resulted in her being held in deservedly high esteem! We wish Vicky well in her new post with West Midlands Trains. In January 2019 Rebecca Styles was appointed our new Community and Sustainability Manager. We look forward to working with Becky - she has already been actively involved in our plans! Liam has left for a new post with ScotRail. We wish him well. And we have recently met his replacement Chris Jackson. We look forward to working with Chris. We are also saying goodbye to Simon Brooks our Local Manager who is moving on to be Manager of Manchester Victoria Station. It has been a real pleasure to work with Simon. His support of FOGS has been much appreciated. We wish Simon well in his new position.